Relatives: Fiancé of Miss Whatling. 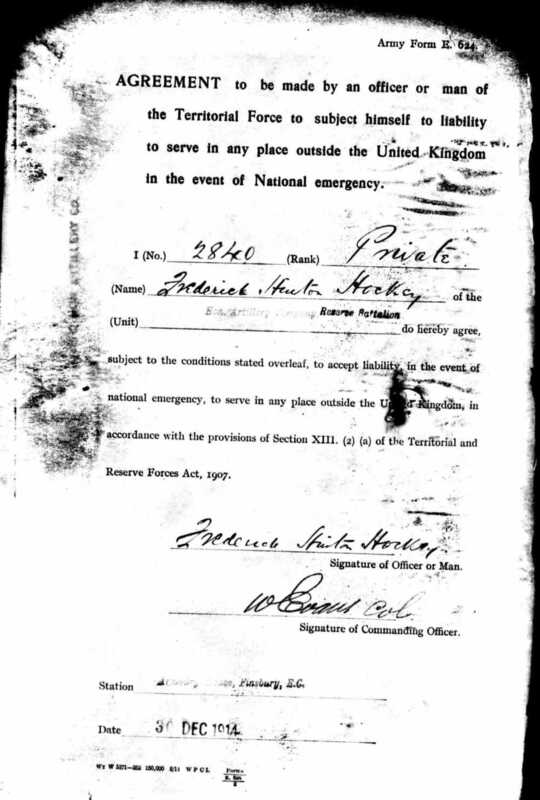 Frederick Hinton Hockey grew up in Middlesex. 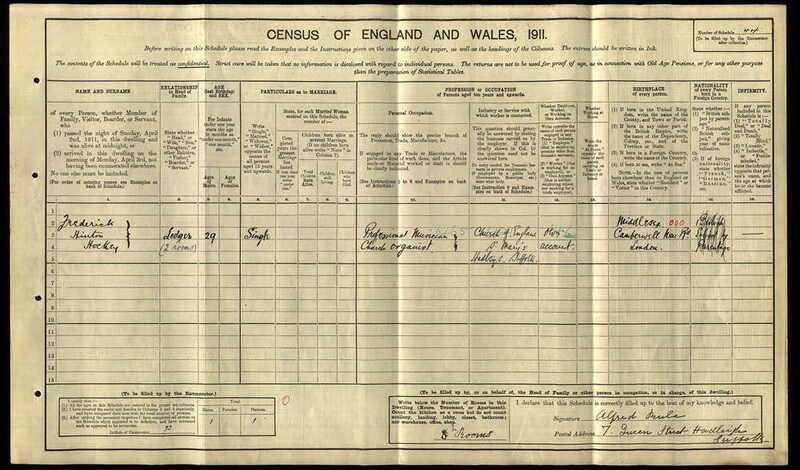 He was the son of a Home Office Civil Servant but by the time of the 1911 census had come to Hadleigh with his work. 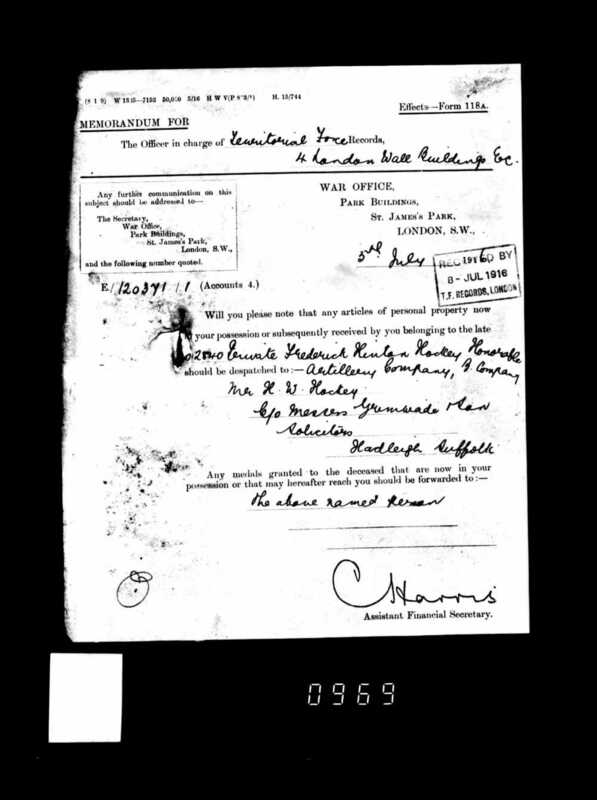 In 1911 he was lodging at 7 Queen Street in Hadleigh and was employed as a professional musician. He was the church organist at St Mary's church. 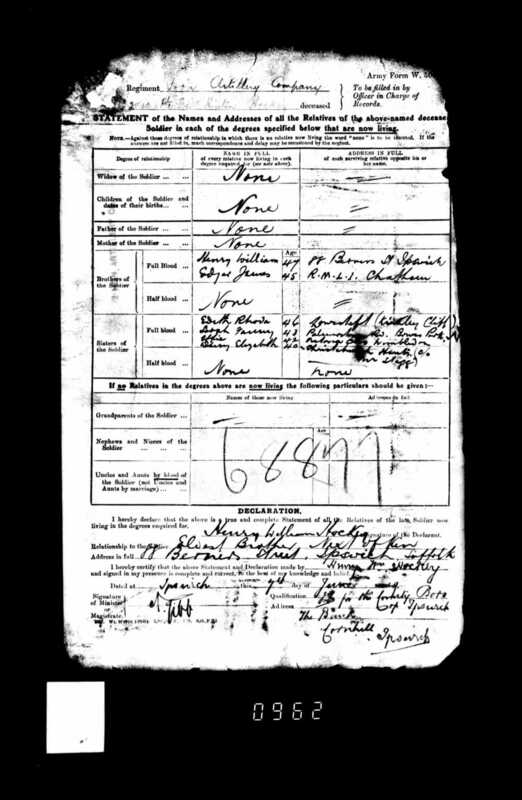 In 1914 Frederick was living at 29 High Street, Hadleigh. 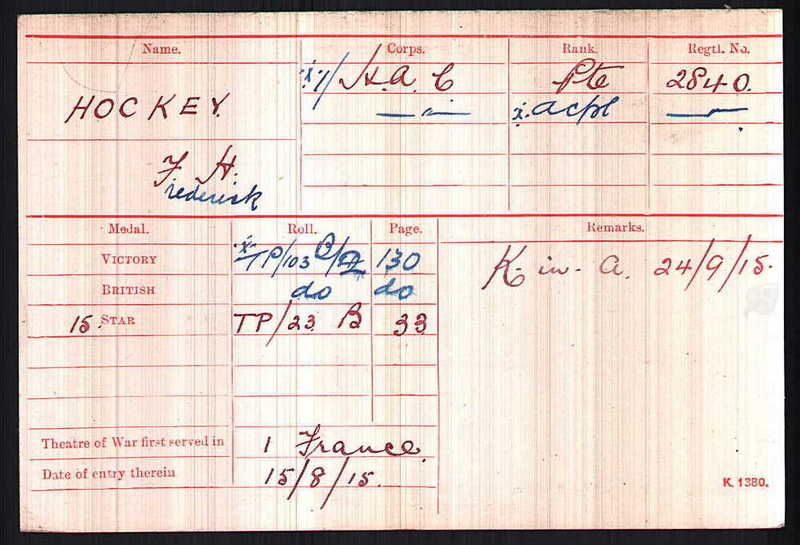 Frederick was entitled to the above three medals; 1915 Star, British War Medal and the British Victory Medal. The whereabouts of his actual medals is currently unknown. 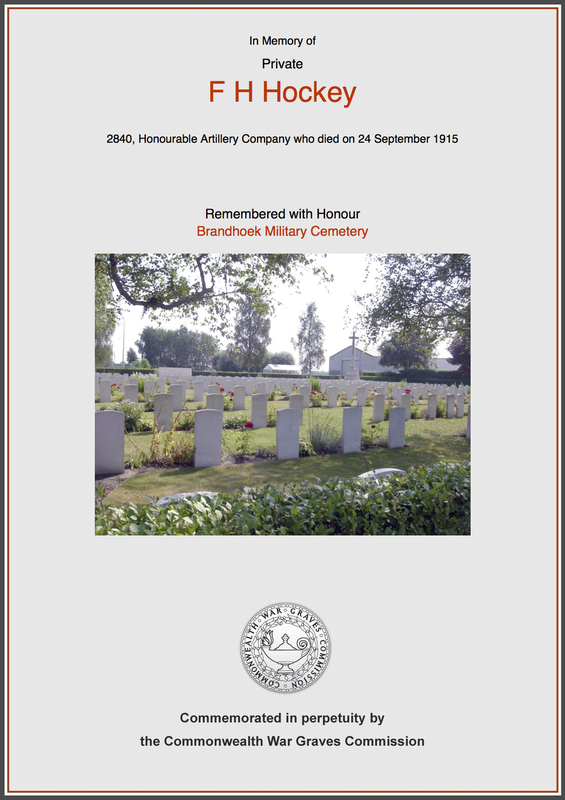 Brandhoek Military Cemetery is located on the road between Ypres and Poperinge. During the war, Brandhoek was within the area comparatively safe from shell fire which extended beyond Vlamertinghe Church and so the area was the site of medical facility. 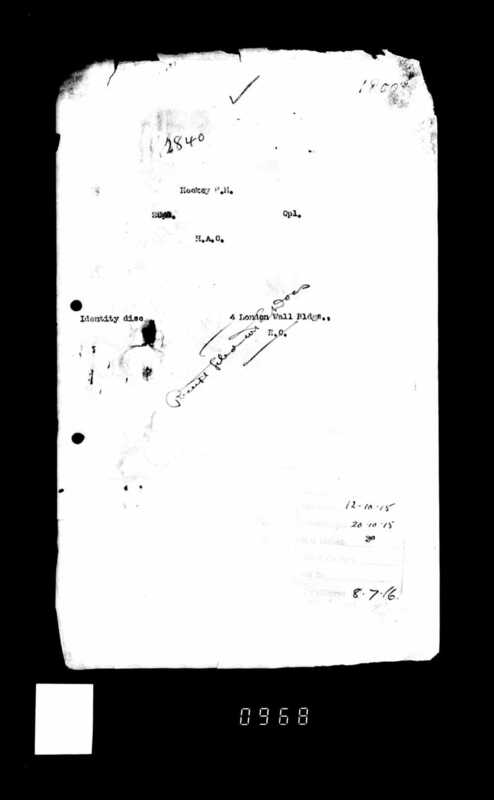 Field ambulances were posted there continuously and a make shift cemetery was established early in May 1915 in a field adjoining the dressing station. 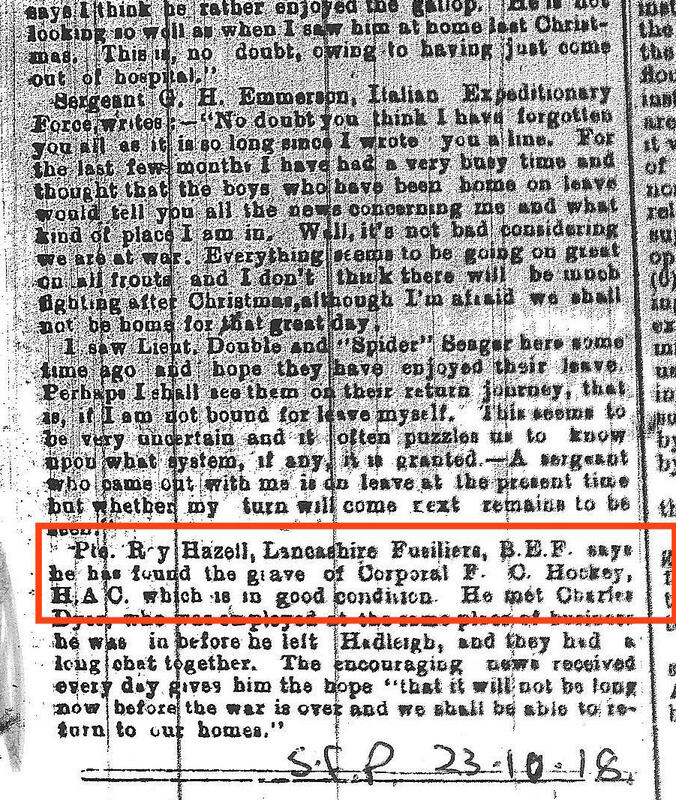 A newspaper article from early October 1915 that reported Frederick's death stated that he was killed by a shell in France. 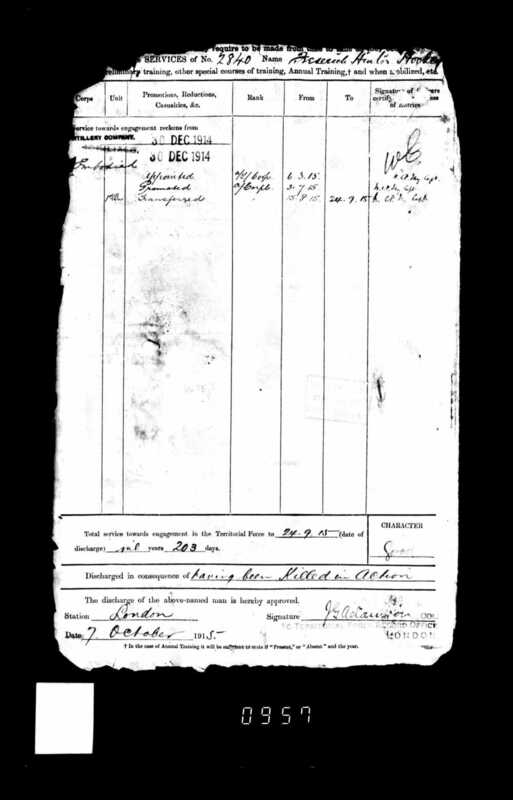 Given that his unit were operating in the Hooge area, it is likely that he was initially wounded by the shell fire and brought back to Brandhoek for treatment. Sadly, like many other casualties, Frederick must have died from his wounds and so was buried in the adjoining cemetery. 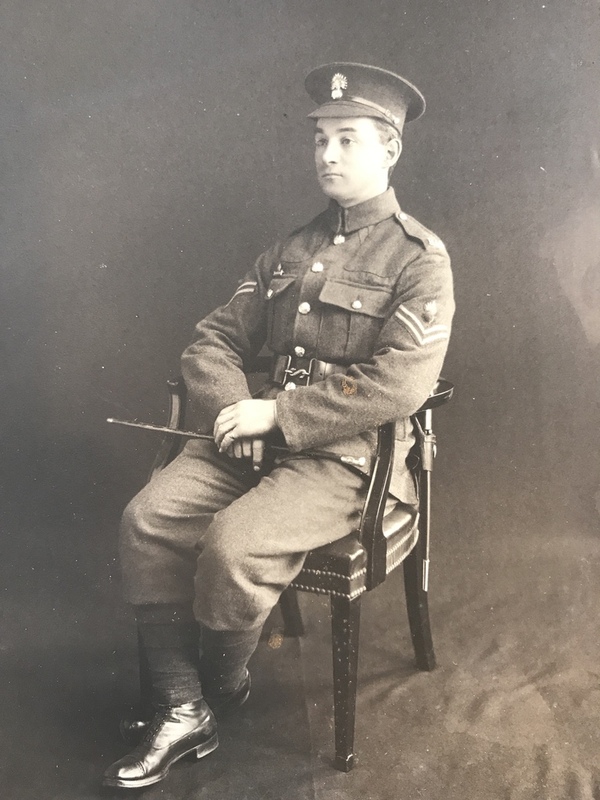 On 30th December 1914, presumably after playing for the Christmas services, Frederick Hockey enlisted with 1st (Infantry) Battalion Honourable Artillery Company. The Honourable Artillery Company (HAC) was a military formation dating back to the days of Henry VIII and during the Great War it become a territorial unit recruiting mainly from the well-educated and relatively well-off, often with close connections to the City of London. 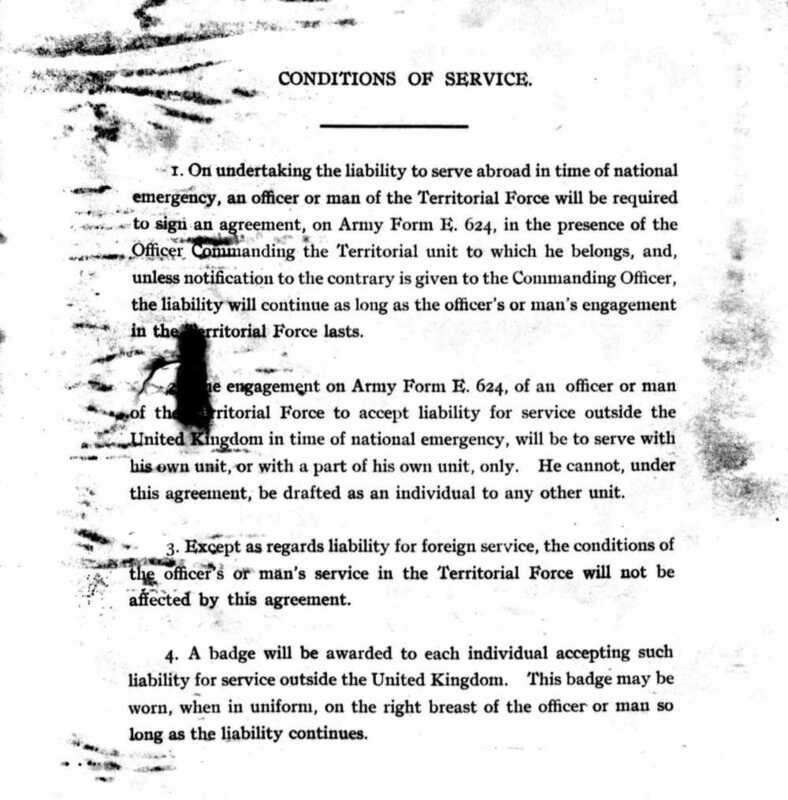 At that time territorial units were liable for home service only and were not required to deploy overseas. 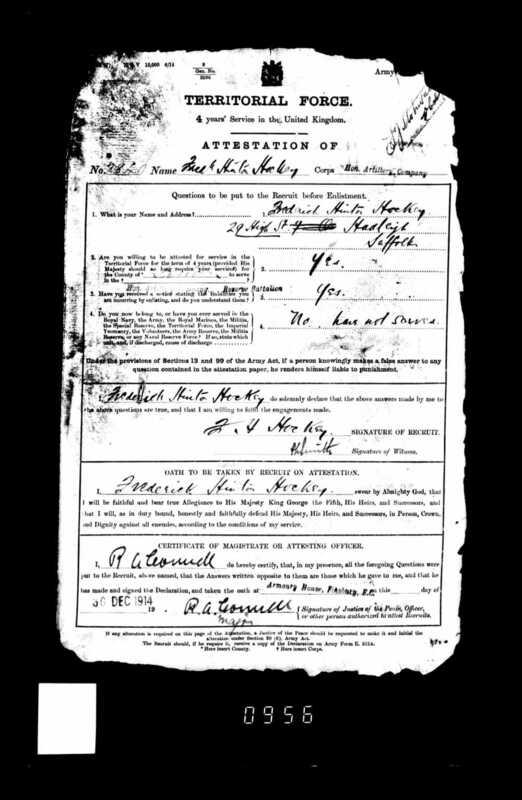 However, when it became apparent that more troops would be needed for overseas service, men were asked to volunteer and Frederick volunteered. 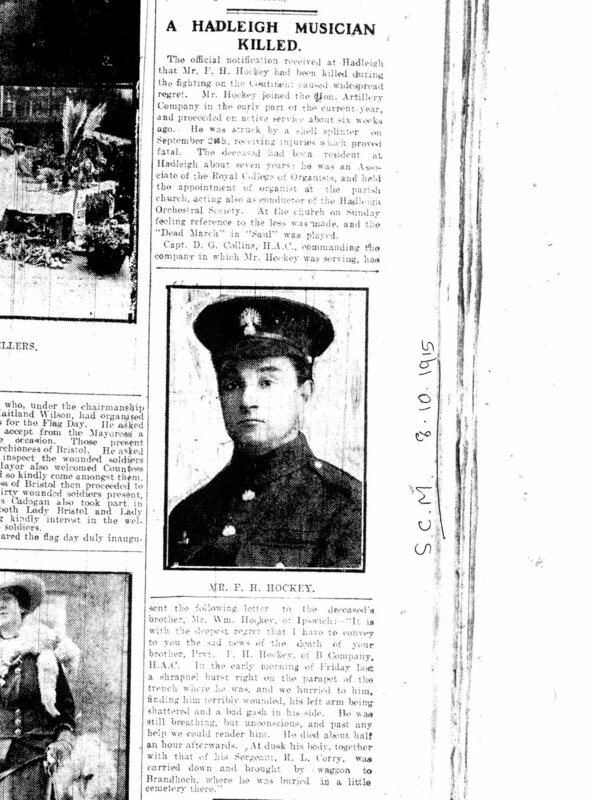 By August 1915 he was in the Ypres Salient and his unit became involved in the continued action around Hooge and the area to the north of the Menin Road. 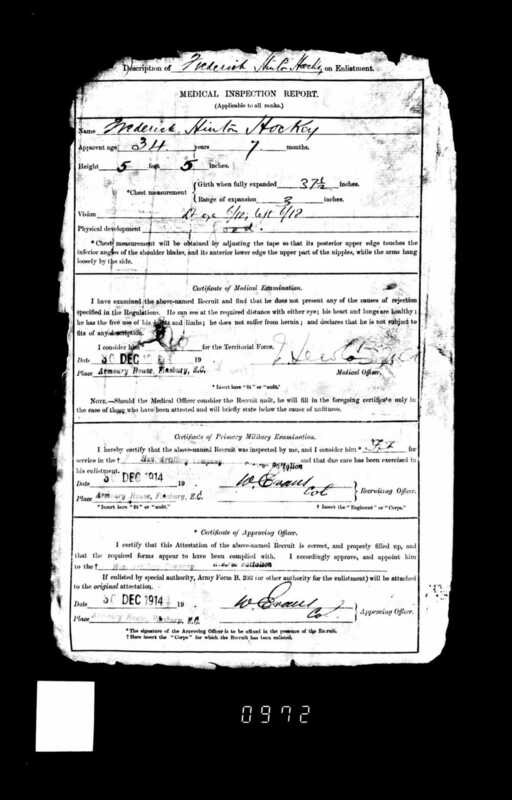 Although his military career was relatively short, he clearly showed potential for advancement which is evident from his service record which shows he was promoted to Corporal. At the end of September the action around Hooge was stepped up largely to distract the Germans from the Allies’ major offensive being planned further south in France just north of Arras, around Loos. It was during this activity that Frederick lost his life. 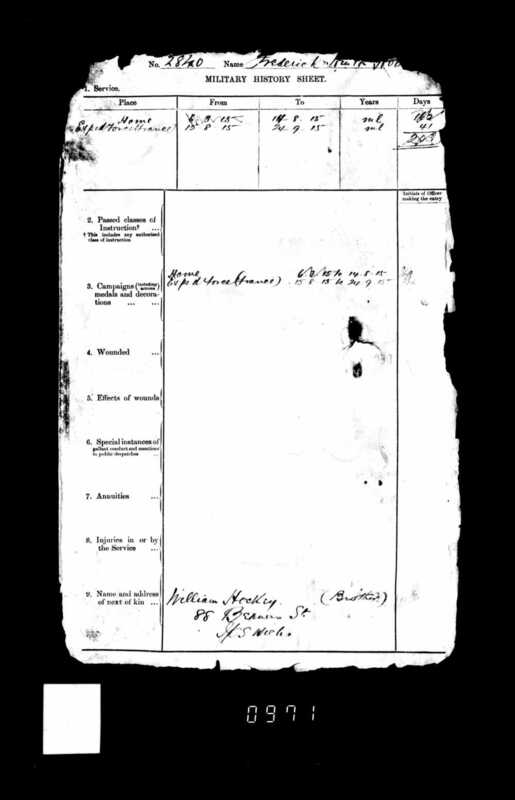 During his time in Hadleigh, Frederick met and fell in love with Miss Caroline Minnie Whatling who was the daughter of the police inspector. They were engaged. 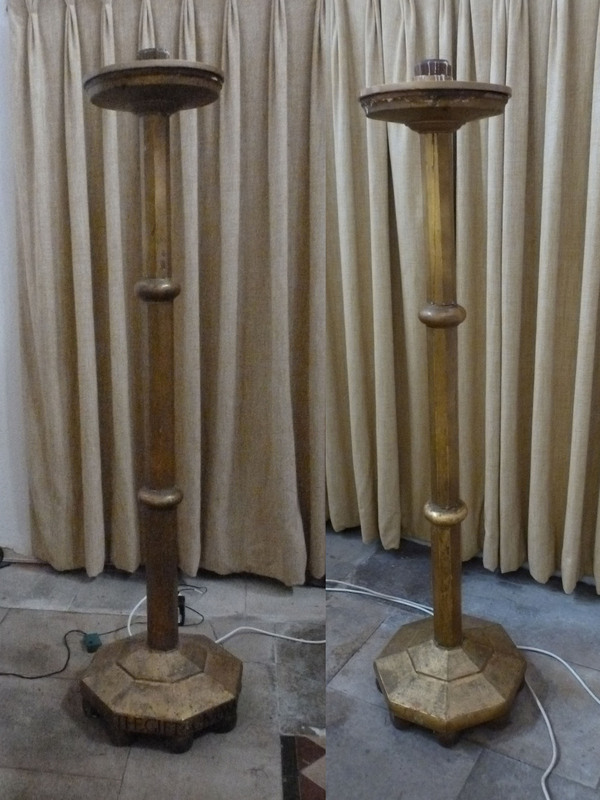 Following his death, Miss Whatling donated a pair of large wooden candle sticks to the church. The pair stand about 5 feet tall and still stand behind the high altar. The inscription on the candle sticks, might appear a bit cryptic to the casual observer, but once you know the story it is easy to decipher. Miss Whatling never married. She later lived in the Almshouses on George Street and died in September 1975. To mark the centenary of Frederick's death, St Mary's church had the candle sticks refurbished ensuring that the memory of Frederick will live on. 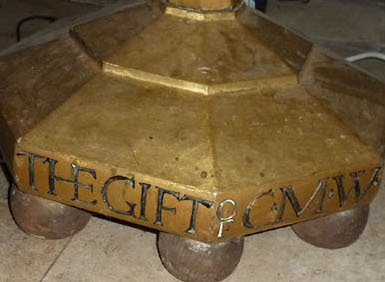 Anyone interested in seeing the candlesticks and other great war memorials should visit St Mary's Church, Hadleigh. The recently refurbished candle sticks by the `high altar at St Mary's, Hadleigh. During his time in Hadleigh Frederick took a keen interest in the community and was involved with a number of local clubs. 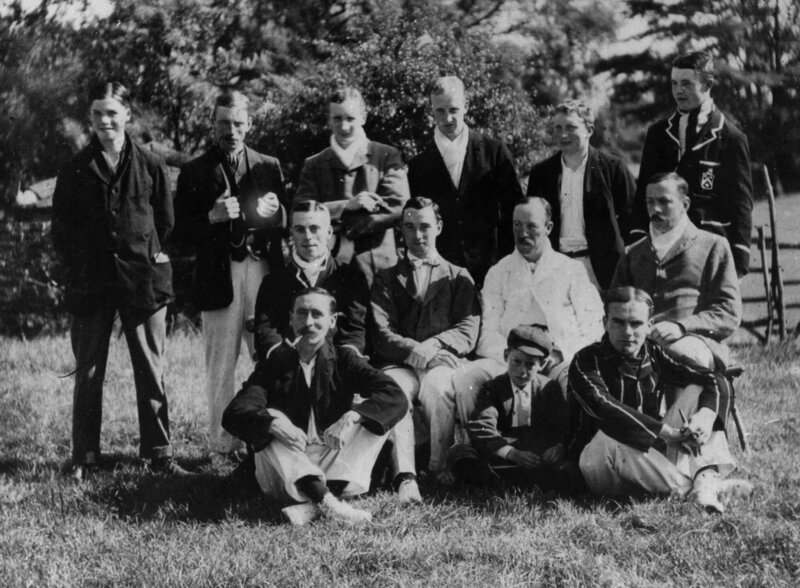 He was the secretary of the Hadleigh Cricket Club and is seen sitting next to the left of the club captain (all in white) in the 1912 team photograph. Frederick came from a musical family and his brother was the School Music Master at Ipswich School, where Frederick would occasionally help out. 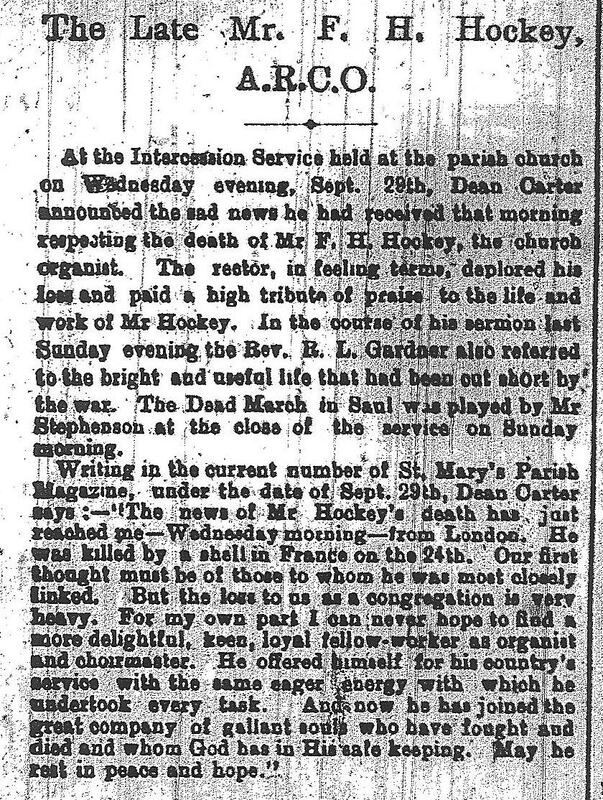 They placed this obituary in the school magazine in November 1915 and interestingly, it includes a statement from an old school boy who was serving in the same section as Frederick when he died. 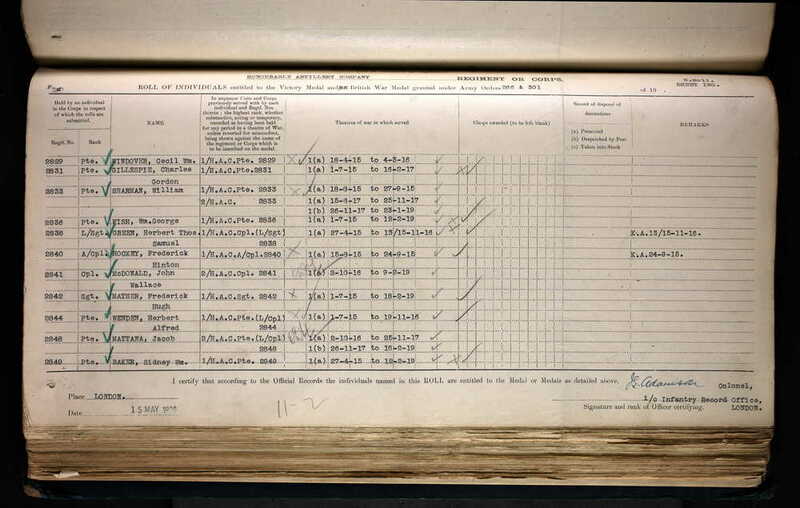 We hope that this page has been able to tell the story of Frederick Hinton Hockey. If you know of any information which might help to add to the story then please get in touch.